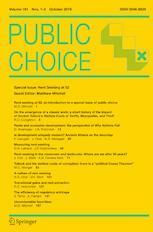 Public Choice is a peer-reviewed journal that studies the intersection between economics and political science. The journal plays a central role in fostering exchange between economists and political scientists, enabling both communities to explain and learn from each other’s perspectives. This journal’s roots are in the application of economic methods to problems normally dealt with by political scientists. While it retains strong traces of economic methodology, currently it also addresses newly developed, effective techniques that are not within the domain of economists.